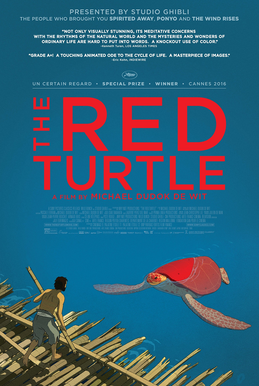 One of this year’s nominees for ‘Best Animated Film’ at the Academy Awards, ‘The Red Turtle’ is a beautifully animated fable that takes place almost entirely on a desert island, after the primary character finds himself stranded there after a storm. The film is a co-production between Studio Ghibli and the European distributor Wild Bunch, written and directed by a Dutchman (Michael Dudok de Wit) and produced by long time Studio Ghibli collaborator Toshio Suzuku, and it’s a strong marrying of styles between Ghibli’s regular output and European cinematic sensibilities. It features no dialogue, an opaque narrative that leaves much to the imagination, and I found it to be a wonderful sensory experience that made me feel more than I understood, and in this case, that was definitely a good thing. The film begins with a storm where our unnamed protagonist is thrown from his boat and eventually washes up on a deserted island. The island has vegetation, wood to make a raft and a variety of wildlife, including crabs and the turtles mentioned in the film’s title, but it’s clearly very far from any kind of civilisation. Initially we follow the man as he builds a raft to head back out to the ocean, but after his attempts are foiled by a red turtle, he retreats to the island in defeat. From this point onwards the film enters a dreamlike state where it’s never explicitly clear where the lines between reality and fantasy sit, as the man starts to hallucinate the presence of fellow people and a variety of other things on the island. One day, he awakens to find that the same red turtle that destroyed his rafts has transitioned into a beautiful women, and he begins to spend most of his time with her over the course of the film. I liked the nice little touches of nature depicted through the animation, whether it’s the Attenborough esque following of the baby turtles heading out to sea for the first time, to the sporadic ‘circle of life’ elements that don’t sugarcoat the reality of nature for any children watching. It’s a wonderfully scored piece of cinema which delivers a real sense of melancholy, and whilst I’m not exactly sure what I was meant to take away from the events on screen, I found ‘The Red Turtle’ to be a deeply affecting and moving experience. I expected there’d be more to the story: that the couple would build a hut or a house, that he’d teach her his language, that she would show him her customs. Hi Carey. I agree that the story was fairly straightforward and didn’t go into as much detail as it could have done, although I didn’t mind that much. Overall I felt the approach was effective for the mood and atmosphere the film was going for.